Our Peaks Pullover is the kind of sweater for which you ignore all the others in your closet. It features flattering and thoughtful details and is day-in-and-day-out cozy and comfortable! Knit in the round from bottom to top, this pattern starts with some short rows to create a sloped back hem, then moves on to add more and more ribs until they join in a pretty peak below the chest. 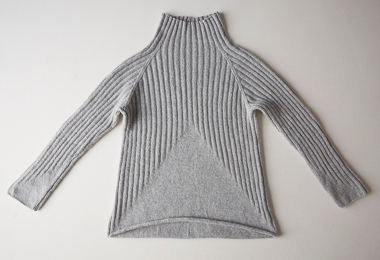 Finish your Pullover with a choice of collars, ranging in height from crewneck to folding turtleneck. And on top of all those beautiful details is our beautiful Cashmere Merino Bloom. A nice light worsted weight, Cashmere Merino Bloom has a soft halo and a super cozy feel, making it the perfect yarn for this very special knit! Please click Product Details, above, for more information about materials, gauge, and sizes.